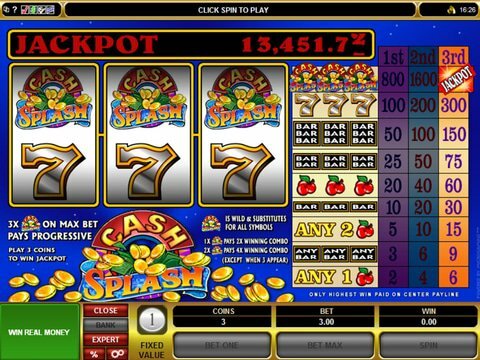 If you like classic slots games with a progressive jackpot then CashSplash 3-Reel may be THE game for you. There are 3 reels and 1 payline in the game where the maximum coin jackpot is 1,600 and with the progressive jackpot the top cash payout can be HUGE. You can bet between $1 and $3 per spin and you can only bet 1 coin per line. Test this free game here with no registration required. There is a wild and scatter symbol and a multiplier, but there is not a bonus game and there are no free spins to be won. The symbols in this free slot are ones you will see in classic Vegas slots games in bars, stacked bars, 7's, and cherries, as well as the CashSplash logo. The CashSplash logo acts as the wild and by spinning on 1 of them your win is doubled and 2 of them will quadruple your win. If you spin on 3 of the CashSplash logos you will be one happy camper, as you will win the progressive jackpot. However, while the progressive jackpot is always growing and can get very big you have to bet 3 coins, which is the maximum bet, for that spin. The colorful graphics in CashSplash 3-Reel from Microgaming make you feel like you are in Las Vegas and the sounds will as well. The paytable is right on the main page so the winning combinations and their payouts are always right in front of you. If Canadian players want to try their luck for the impressive and always growing progressive jackpot playing this free slot then Maple Casino is an online casino you can do just that. You will also receive $3000 as a no deposit bonus!